Mr Ryan Whelan founded The Aberdeen Law Project in 2009 and was our Student Director between 2009 and 2011. He graduated with an LLB (Hons) from The University of Aberdeen in 2009, receiving the Cruickshank Prize for graduating top of his year with First Class Honours. Having served as President of the Law Society in his senior honours year, Mr Whelan was awarded the Edmond Prize in Law (2008) and was the first law student to be recognised with the prestigious Quincentenerian Award (2010). He has been further honoured for his work in founding ALP with an award from the Attorney General. Mr Whelan was also selected by The Bank of Scotland to run with the Olympic Flame ahead of the London Games in 2012. As a student, Mr Whelan advised and represented numerous clients, including the family of Claire Morris. He also visited law clinics in the USA (including NYU and George Washington), spoke at conferences on pro bono work, wrote articles on ALP and co-founded The Scottish University Law Clinic Network. Mr Whelan is currently an Associate at Gibson, Dunn & Crutcher LLP, specialising in litigation, international arbitration and white collar crime. He is also the Chair of ALP's Board. Professor Sir Ian Diamond was the Chief Executive of the Economic and Social Research Council before his appointment as Principle and Vice Chancellor of The University of Aberdeen on 1 April 2010. He graduated in 1975 with a BSc (Hons) in Economics and in 1976 with a MSc in Statistics from the London School of Economics and Political Science. Professor Sir Diamond then received his PhD in Statistics from The University of St Andrews in 1981. He began his academic career at Heriot Watt University in 1979. He then joined the University of Southampton in 1980 where he was a Lecturer, Senior Lecturer and Professor. At Southampton, Professor Sir Diamond was appointed Dean of Social Sciences in 1997 and then Deputy Vice-Chancellor in 2001. Professor Sir Diamond was elected to the UK Academy of Social Sciences in 1999. He is currently a Fellow of the British Academy (2005), a Fellow of the Royal Society of Edinburgh (2009). Professor Sir Diamond also holds honorary degrees from the universities of Cardiff and Glasgow. More recently, in 2013, Professor Sir Diamond was Knighted for services to social science and higher education and was commissioned as a Deputy Lieutenant of Aberdeen. Mr Greg Gordon is a graduate of the universities of Aberdeen and Cambridge. Prior to becoming an academic, Mr Gordon practiced law as a dual-qualified commercial litigator in Aberdeen and London. He is currently the Co-Director of the LLM course in Oil and Gas law. His primary research interests are within the law of delict and energy law. He is also an author of numerous articles on both subjects. 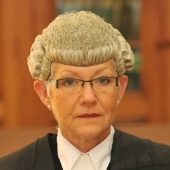 Lady Leeona Dorrian was a Senator of the College of Justice from 2005 until her appointment as Lord Justice Clerk in April 2016. She is a graduate of The University of Aberdeen (LLB). She called at the Faculty of Advocates in 1981, where she served as Standing Junior Counsel to the Health and Safety Executive and Commission between 1987 and 1994, as an Advocate Depute between 1988 and 1991, and Standing Junior to the Department of Energy between 1991 and 1994. Lady Dorrian was appointed Queen's Counsel in 1994. Having been appointed Lord Justice Clerk, Lady Dorrian is the most senior woman in Scottish legal history. Lord Stephen Woolman was appointed as a Senator of the College of Justice in March 2008. He is a graduate of The University of Aberdeen. Between 1978 and 1987 he was a Lecturer at The University of Edinburgh, where for 3 years he was the Associate Dean of the Law School. In 1987, Lord Woolman was admitted to the Faculty of Advocates. He was Standing Junior Counsel for the Inland Revenue, the Ministry of Defence (Procurement) and the Office of Fair Trading. He took silk in 1998. From 1999 to 2002, Lord Woolman served as an Advocate Depute. Between 2004 and 2008 he was Keeper of the Advocates Library. Lord Woolman was formerly Chairman of the Scottish Council of Law Reporting, the Bar Mediation Group and the Free Legal Services Unit. He is the author of the leading student textbook on the Scots law of contract and also Deputy Chairman of the Boundary Commission for Scotland. Mr Gary Allan QC graduated from The University of Aberdeen in 1980 with an LLB (Hons). He was called to the Bar in 1994 and appointed Queen's Counsel in 2007. Between 2007 and 2011 Mr Allan QC served as Senior Advocate Depute for the Crown Counsel. Dr David Parratt, a member of the Faculty of Advocates, graduated from The University of Aberdeen in both the LLB (Hons) and Diploma in Legal Practice. Since calling at the Bar in 1999, Dr Parratt has focused primarily on civil work - specialising increasingly in construction, contract and general commercial law and, from an early period, trusts, heritable property and agricultural law. As well as being a member of Terra Firma Chambers in Scotland, Dr Parratt is a member of Crown Office Chambers in London. Although he is still based in Edinburgh, the nature of his practice frequently takes him to London, the Middle East and the Far East. Dr Parratt is also active in dispute resolution holding the qualification "Chartered Arbitrator", as well as being a Fellow of the Chartered Institute of Arbitrators. He is also accredited as a CEDR Mediator. When he can find the time, he also enjoys various academic pursuits. Dr Parratt has a number of publications and Scottish Arbitration Handbook was published in 2011. He tutored in private law at The University of Edinburgh from 1996 until 1998. Dr Parratt is also an Honorary Lecturer in dispute resolution at the Centre for Energy, Petroleum, Mineral Law and Policy at The University of Dundee, an Honorary Research Fellow in international arbitration at The University of Dundee's the School of Law and a Visiting Senior Lecturer in dispute resolution, international arbitration and construction law at The British University in Dubai. As a Partner of international law firm Pinsent Masons, Mr Roger Connon has extensive expertise in the corporate and corporate finance sectors, including work on acquisitions and disposals, private equity and corporate reorganisations. The 2015 edition of the Legal 500 emphasises his experience in the oil and gas sector. Mr Connon has acted for both UK and foreign service companies and as well as small independent E&P companies, acquiring, securitising and selling UKCS oil and gas licence assets. Mr Connon is currently the Head of Pinsent Masons' Aberdeen office. Professor Roderick Paisley holds the Chair of Scots Law at The University of Aberdeen. After graduating from Aberdeen, with both the LLB (Hons) and Diploma in Legal Practice, Professor Paisley spent a period of time working as a Solicitor in private practice before joining the Law School as a Lecturer. Professor Paisley specialises in the law of property, conveyancing, succession and trusts. He has written extensively on these subjects and is recognised throughout Scotland as a leading expert on the law of conveyancing generally and the law of servitudes particularly. Sheriff Annella Cowan completed her LLB (Hons) at The University of Edinburgh and practiced as a Solicitor prior to calling at the Bar in 1987. She was appointed Sheriff of Grampian and the Highland and Islands at Aberdeen in 1997. Sheriff Cowan became Senior Sheriff in 2008. As an undergraduate, Mr Malcolm Combe was a founding member of The University of Strathclyde Law Clinic, then acted as a supervising Solicitor for 2 years at The University of Edinburgh Free Legal Advice Centre. He joined The University of Aberdeen in 2011 following a period as a Solicitor in private practice. Mr Combe is the Faculty Director of The Aberdeen Law Project, a supervisory role of our legal services. He is also an active member of the Scottish University Law Clinic Network, having participated in its inaugural conference in June 2012 and its yearly meetings since. In the last few years, Mr Combe completed a Postgraduate Certificate in Learning and Teaching in Higher Education at The University of Aberdeen, which makes him a Fellow of the Higher Education Academy. Miss Jodie Chandler graduated The University of Aberdeen with an LLB (Hons) in 2012 and obtained a Diploma in Legal Practice in 2013. Miss Chandler was a founding member of ALP and, before taking the role of Student Director in 2011, she was Head of Representation, Head of the Housing Sector and Deputy Student Director in 2010. Mr Adam Davies graduated from The University of Aberdeen with an LLB (Hons) in 2010. He then studied for the Diploma in Legal Practice in 2011. Mr Davies passed the Association of Tax Technicians examinations in 2012 and worked as a Private Client Tax Associate at Deloitte, before moving to PwC as an Associate. He returned to The University of Aberdeen in 2014 to study for an LLM in Oil and Gas law. He is now a Trainee Solicitor at Brodies LLP. Miss Anna Robertson was our third Student Director (2013-2014). She graduated from The University of Aberdeen in 2013 with an LLB (Hons) and, in the following year, a Diploma in Legal Practice. During her time with ALP, Miss Robertson held a number of positions. In her first year, she was a Sector Adviser with the employment team. Between 2012 and 2013, Miss Robertson served as the Deputy Student Director. Miss Robertson has long been involved in the advancement of children's rights. She was a founding member of the Peer Advocacy Service, which provides support and assistance to vulnerable children, and is a founding member and Secretary of Youth Chex, a grant giving organisation for young people. Casus Omissus is a Company Limited by Guarantee registered in Scotland (Company no: SC381494).. Registered Office: 12-16 Albyn Place, Aberdeen, AB10 1PS.